This entry was posted in Code and tagged displaytag, excel, export, java. Bookmark the permalink. THIS HELPED ME TREMENDOUSLY!! THANK YOU. the example is NOT working for me, can we get the source code? Sorry I am not allowed to give out the source code. Can you tell specifically what have you done and what part is not working? Hi, as I replied to judy earlier, I cannot share our proprietary code but I can try to help you if you explain in more detail what you are trying to do, what you have done and what is the problem. Are you using the org.displaytag.export.ExcelView exporter or the separate org.displaytag.export.excel.DefaultHssfExportView? If I remember correctly, the ExcelView will not export captions or footers but the DefaultHssfExportView will. 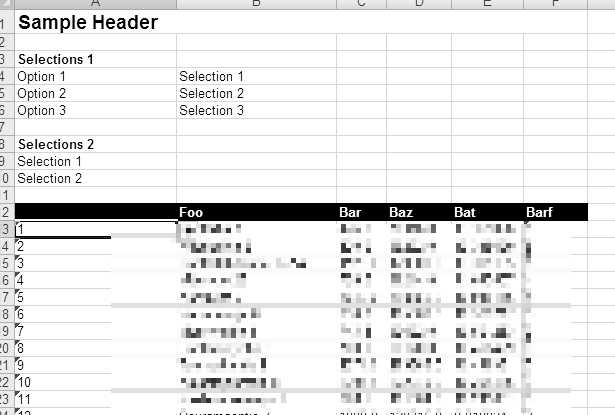 My display table has a column where I show text information in a hyperlink. 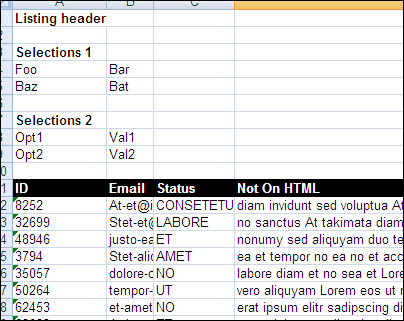 I need to export this data which has HTML images too. Currently when I click export to Excel it shows the text in hyperlink. I would like a step by step example on how to do it. Please help! Sorry, this is something I have no experience with. I don’t think it is even possible to have Excel render HTML in the cells (see http://stackoverflow.com/questions/1842071/can-excel-interpret-a-cell-as-html). If you can access the images some other way (for example you have them in your classpath somewhere), you could write your own BinaryExportView implementation and use POI to insert images into the spreadsheet. Check out HSSFWorkbook#addPicture(..) and a code example in this forum discussion. Unfortunately I can’t give any more detailed help for you in this case. will it work for exporting in pdf too?? The same approach should work for PDFs as well, but instead of looking at the DefaultHssfExportView and HssfTableWriter you have to implement your own PDF export view similar to DefaultPdfExportView where you handle your custom caption data and generate the corresponding headers using iText.